We didn’t get rain out of that storm, just a beautiful rainbow. It was 78 degrees that day. We won’t see that again until next year. When family calls, you do what you have to do, and the homestead suffers. I had to leave from September 24-29, and that after we had gone on a quick trip to California to see Eric Clapton the week before. There might have been an actual week of work somewhere in there, but it’s a mostly blur of trying to keep food from spoiling and prioritizing jobs that had to be done before the first frost. Husbandry and gardening: We nursed the tomatoes and other tender crops through the first night of frost on September 21, and usually that is enough. This year, we had three nights in a row, and by the end of that, they were done. We pulled a lot of green tomatoes off the plants before the first night, basically anything that might ripen. We are canning green tomato salsa this year; so few tomatoes ripened (we had to buy plants after all my transplants froze in April and now think a bunch of them were mislabeled). A new-to-us variety, Paul Robeson, was the surprise winner this year – two of my seedlings survived all the abuse and actually produced a reasonable amount of fruit. I also brought in a heap of jalapeño, habanero and bell peppers. Skunk #7 met his maker. We collected over 2 gallons of honey and have a couple of hives that look ready to split into two next spring, with only a few stings each. We finally organized a hay delivery for the goats, and R finished tidying up the barnyard area. We replaced the greenhouse film on the hoophouse. Unfortunately, the replacement came with a tear, so we are going to have to take it off and redo it when the replacement for the replacement arrives. I wanted to do a time-lapse of how we pull it over the structure, but we were rushing because a storm was coming, so I’ll do it when we repeat the exercise, hopefully this weekend. Food, harvest and preserving: Tomatoes became salsa, were roasted and covered in olive, and pureed into sauce. R brought the shallots in. Early on, I had the dehydrator going for herbs and jalapeños, and froze a bunch more beans, herbs and a butter/parsley puree for dolloping on potatoes. I made some fermented salsa to eat before we tap into the canned stuff. We have been eating potatoes again, both the Daisy Gold and Kennebecs did well this year. We gathered a heap of winter squashes, mostly Burgess Buttercup. I really shouldn’t bother growing anything else since that one outperforms everything else I try. Finances: We went to Costco for the month on the way back from the concert. It had been over six weeks since the previous trip and we only ran out of cheese. We didn’t buy a single thing from Amazon in September, which may be a record. We are still trying to figure out what our monthly medical insurance costs are going to be, what with Medicare supplements and add-ons. Energy and conservation: We got a phone call from the guy who cleans our chimney – he had a cancellation and could do ours right then, so we jumped on it. We are breaking ice on the animals’ waterers, but are holding out on setting up the electric deicers for as long as possible. Other projects: I have been less focused on training Wyatt than I’d prefer, but more consistent in enforcing the daily rules of the ranch that Carson already lives by. Wyatt hass learned to back up, lie down, and respect the “Slate first” command. Backing up and “me first” are essential good manners at all gates and doors. We are working on heeling now, and trying to break the infernal jumping when anyone arrives at the homestead. I’m trying to think of a trick to teach them to do together, sort of a snow day project for when they are bored inside. Suggestions are welcome. Carson is finally getting a bit more control when he helps herd stray birds back into their pens. He gets so excited that he puts too much pressure on them, but lately he’s been better at following commands at a distance. Carson is super at letting us know when a turkey has escaped from the orchard (their wings need clipping) by barking at them and running back to us. He doesn’t do this behavior in other situations, so we know he’s telling us something, and if we don’t get on it, he gives us an urgent bark like no other. Wyatt hangs back and observes more than gets in the way when we are herding poultry; he’s much more interested in four-legged beasts. The deer are starting to migrate down from the mountains and neither dog is tolerating them being anywhere on the property. Community: R and I went to an economic development meeting about Torrey’s Main Street commerce. Creativity and recreation: I bought a new eight-string electric Fender mandolin in Los Angeles and promptly hung it up. I think I have had the chance to play it once. It is a great little instrument and I’m looking forward to making a lot of joyful noise with it. Next week: More tomato canning, then a quick trip to Salt Lake to get new phones, a brake job and a computer repair. R has to do some science, so he will stay a couple nights extra. I need to drop into the thrift stores and hunt for coolers. We don’t have a proper root cellar, so we pack things into coolers in the unheated garage. If it is predicted to drop below 0 deg F, we might bring them in the house, but other than that, things hold up pretty well. We have a lot of carrots, beets, parsnips and potatoes to bring in once I’m sure it’s really going to stay cold. On Saturday, October 7, we are doing a honey tasting for the Entrada Institue. Usually we do an apple tasting this year, but with no fruit, we decided to showcase local beekeepers instead. If you are in the area, please join us at 6:30 at the Robbers Roost on Main Street in Torrey. Seasonal observations: The bird life shifted dramatically as the weather started to get colder. We have seen a juvenile Golden Eagle, a Cassin’s Kingbird, a pair of sandhills and a mixed flock of starlings and red-wing blackbirds. The peach trees have just started to color up. Mostly what we notice is the shorter days and how far north the moon sets in our bedroom window. There’s still a lot to be done before our “long winter’s nap” but the food slowly moves from ripening on the counter into the pantry, and we can spend some time reflecting on what worked and what we want to do next year. Isn’t it the truth? I go on vacation for a week and spend twice as long getting myself back on regular time. Our Colorado camping trip was wonderful, the dogs are great campers and Ouray is a fun place to hang out for a while. The wildflowers were spectacular. I want to go back for aspencade in the fall. So we went, came back and went again, to SLC for another Red Butte Garden concert and a big shop. We have relied heavily on friends to house sit and otherwise care for the barnyard creatures. All of R’s work to get the garden watering automated paid off handsomely. Husbandry and gardening: We are having a hell of a time with the turkeys this year. They rejected their coop in a rainstorm and we moved them into the orchard, only to discover that one had escaped the covered pen and been attacked, probably by a hawk. Since then we’ve lost two more to predators. Probably skunks, as raccoons would have killed wantonly, and the big hawks around here won’t stoop in the trees. So now we are down to nine, with more than three months to go before they are ready for harvest. It’s enough to drive us back to raising chickens. Jersey Giants would be in the freezer already. We have a skunk trap set right now because R saw them eating our bees. He went out with was out with a flashlight looking for turkeys and saw the skunk shaking the hive to get the bees to come out. No bueno. Then Carson got skunked again (twice since we’ve been back). And there are more skunks at the Bluebird orchard, probably doing the same thing to those hives. Getting rid of them is going to be a project. Until then, I’m laying in more hydrogen peroxide for deskunking, and marshmallows because a friend who knows stuff told me to use them to bait the trap. Before the end of July, I started seedlings for fall transplanting, and they are doing well. The garden plan for the hoophouse this winter is less than ambitious, but I do want to do some greens under low cover outside, so I started three trays, or about 150 plants. Now that the garden is in the “growing to make up for lost time” mode, the main task is tying up tomatoes and trellising cucumbers and squash. We have had rain almost every day since mid-July, with cooler daytime temperatures, slowing down tomato ripening but making luxuriant growing conditions. Tomatoes will happen in plenty of time. R has been mowing for a week in the orchards. It’s like painting the Golden Gate bridge, once he finishes it’s about time to start over, especially with all the rain. This year the trees we planted in 2014 are really putting on the growth. They say that apple trees sleep the first year, creep the second and leap the third. We usually get more than one year of creep before they take off though, more “sleep, creep, weep, leap” because by the third summer, we start to worry. And then they take off in the fourth year. Food, harvest and preserving: Garlic is our first big crop of the year, and the Red Toch variety I planted last fall finished earlier than any I’ve tried before. 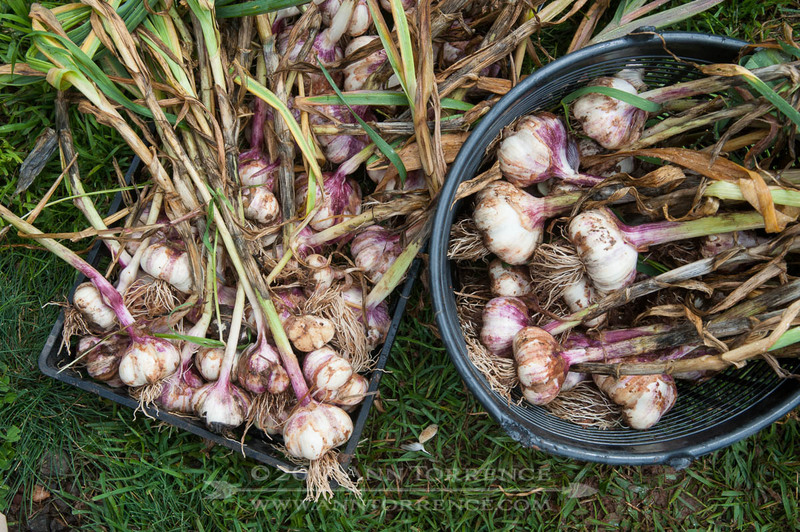 I need to weigh it and set aside the seed garlic for fall planting, now that the garlic has dried and been braided up, but we have plenty and I’m thinking of making some pickled garlic. Until last week, we mostly have been eating zucchinis (Costata Romanesco and Golden Arrow, a really nice yellow summer squash). Now we are getting cucumbers, the kale has rebounded and the green beans are almost ready to pick. R dug up some new potatoes that were nearly full-size. I couldn’t get the red seed potatoes I usually buy along with the Kennebecs that are our staple, so we are trying a new yellow potato, the Daisy Gold. The first ones were delicious. We had them last week with some salmon from the freezer. I am easing into the food preserving. I started with refrigerator zucchini pickles a couple weeks ago. Yesterday I put a batch of mixed zukes and cukes into a fermenting jar and salted down about a gallon of pickle spears to can up today in a vinegar solution. R is the pickle fiend, we’ll see which ones he likes best. Energy and conservation: When we moved the turkey poults, we finally unplugged the last heating device of the season. I hate blowing electricity on heat, but baby chicks need a heat lamp. I’m planning to consolidate watering basins for the winter so we can cut down on deicers. Last year we ran four, which is more than I want to pay for. On the other hand, the water bill savings with the new irrigation control has been substantial: the Rachio will pay for itself this summer. That’s a win. Other projects: With R here now full-time, we have had the time to work through some of the backlog of infrastructure upgrades we’ve wanted to do, and just catch up on things. I stacked firewood, he’s been reorganizing the “warehouse” of spare parts in garage and hoophouse and clearing out so we can upgrade our hoop-sheds. Tools are getting cleaned and put away. Community: I helped out with the “Take the Stage” youth music workshop the Entrada Institute sponsored, which meant I got to spend two days with Samba Fogo instructors banging on drums. Creativity and recreation: loads of mandolin practice, especially on my 5-string electric. Camping gear is sorted and ready to go as soon as it stops raining for a few days. Can’t complain about rain. Next week: more same days. The duck pen needs to be cleaned out and composted. Nothing exciting, just enjoying the end of summer. Seasonal observations: We are seeing the first signs of the changing season, now that we’ve passed the cross-quarter day of Lammas. The rabbitbrush has started to bloom, dotting the roadsides in brilliant hues of chartreuse changing to marigold as the flowers open up. Even more certain signs are the sparrows, flocking up now that they aren’t defending nests. The goldfinches arrived last week to nibble on sunflowers and grass seedheads. Spring brings us the insectivorous warblers hunting the hatches in the succulent soft green leaves; sparrows and finches are birds of the harvest season, gleaning ripeness from the fields and margins. The first flocks, even more than the shorter evenings, is a reminder to savor every chance we have to be outside in the sunshine. We have been on a quest to find our favorite breakfast sausage. It isn’t the one from the fancy pants, full price, nuts and fruits chain grocery. That was as bland as could be. 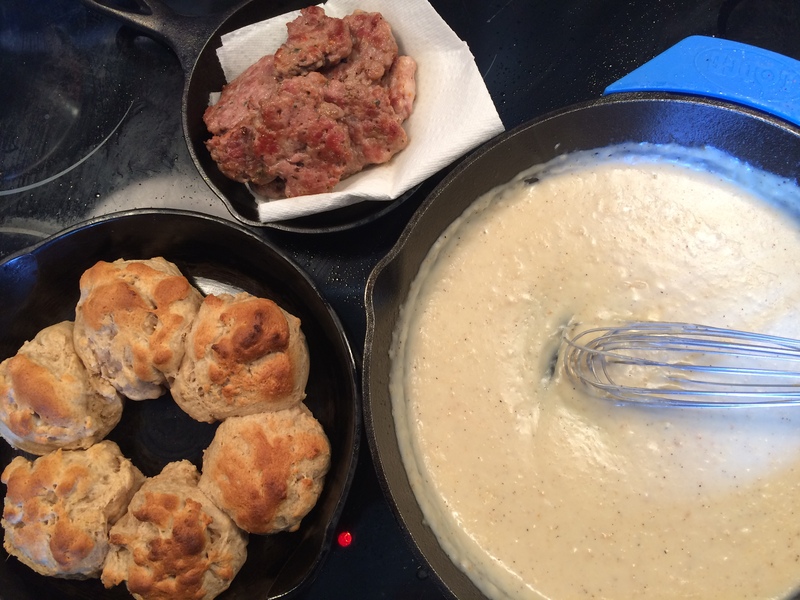 Sourdough biscuits, sausage patties and my first attempt at sausage gravy. Just so you know, boring sausage makes insipid gravy. Once a month, R and I have a coffee date and update the homestead to do list and sync calendars. We cross off the stuff we got done the last month and do triage on the things we need to do on the homestead and maybe even get ahead. Things like, “the turkey poults are coming, how many bags of starter feed should we order” and “what kind of tomato supports do you want to try this year?” are necessary, but not all that fun. So we started scheduling a fun activity or two each month as well. For May, we had planned to take the dogs on a picnic up on Boulder Mountain and introduce Wyatt to chilling with us in unfamiliar territory. It was all planned for last Wednesday, the day after R went up to SLC for some routine medical stuff. R hadn’t been gone 10 minutes when Carson raced through a gate and yipped. He somehow caught his skin on the edge of a livestock panel. Husbandry and gardening: Because the universe conspires to make us laugh at ourselves, R and I had taken all three pets to the vet on Monday. Slate needed a follow-up on his abscessed front paw, which he wasn’t putting any weight on. Naturally, he was cured during the car ride over, but got some more antibiotics anyway. Wyatt got his puppy shots and Carson got to ride along and get his annual shots. Vetting done for the year, or so we thought. The next day, while Carson got worked into the vet’s schedule, Wyatt and I had a delightful time wasting four hours in Richfield. Wyatt learned about the miracle of the drive-through fast food and discovered concrete sidewalks and street lights. I used the time to get an estimate on fixing the deer damage to the 4Runner, and then we had a delicious mole chicken on the patio of La Gringa. Wyatt likes chicken. Eleven stitches later, our assignment this week is to keep Carson from running, jumping and otherwise ripping out the stitches. Needless to say, the day trip has been delayed. Instead, we dug the garden beds for the solanaceae: potatoes, tomatoes and peppers. Our garden rotation plan is a three year cycle for the solanaceae. R would always plant more tomatoes, but there are six beds and that’s it and it’s enough. We put three beds into tomatoes, two into potatoes and the last one gets peppers and some basil. R got the irrigation system started up while I filled the water tube season-extenders. Last year we did the experiment of red vs green with the same kind of tomatoes, and the plants in the red ones got bigger faster, but we still have loads of the green ones that will stay in rotation. Some of our collection have got to be over 15 years old. If you use the wall-of-water type season extenders, do yourself a favor and buy this hose filler. It’s ridiculously expensive. It will last forever, and you won’t be dripping wet when it’s over. There have been years I swore I should have worn rain pants. We had one in Salt Lake and misplaced it in the move. It took me hours of scouring the Internet to find a replacement, at a rabbit husbandry site of all places. This hose attachment is the bomb. (No affiliate link, just an unsolicited endorsement.) Buy it and put it in your Christmas stocking for next year. We put honey boxes on five hives. We would have done so for the other three hives but the boxes weren’t assembled yet. The new split hives look good but we didn’t take out individual frames and check on them. Either they will make their own queen or not, we aren’t interventionists as a rule with the bees and so why bother them? Energy and conservation: R changed out the the track lighting bulbs to LEDs. We had to borrow a ladder that could reach to the highest part of the ceiling. Besides saving electricity, it’s going to be a lot cooler inside—400 watts of halogen bulbs get hot. The last time we changed them out, the LED bulbs were outrageously priced. This time they were nearly the same as the halogens. We finally ordered some outdoor blinds for the porch, after five years of thinking we might extend it with a pergola to block the late afternoon sun. For about three hours each afternoon, our west-facing porch is in full sun until the shade of the cottonwood trees finally reaches it around 8:00 pm. The heat that builds up on the porch permeates into the rest of the house and since we don’t have air-conditioning, June and July can get uncomfortable unless I am diligent about closing doors and windows. It remains to be seen how they hold up in the wind. Skills: Dutch-oven cooking and outdoor cooking in general has been high on my list of skills to practice. This weekend I waited and waited for the wind to die down; finally on Sunday the weather cooperated. Too bad the charcoal did not. Lessons learned: don’t buy off brand charcoal, just use the firewood and practice with simple recipes that can take a variable fire until I figure it out. Community: Saturday was the opening event for the Entrada Institute, a jazz trio and a chance to clean up and see friends for a couple hours. I helped spring clean the venue. R is practicing with some mates to perform at Apple Days in July. 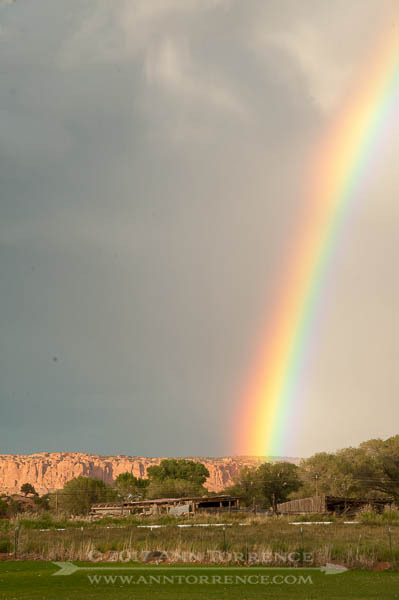 Some friends from Salt Lake invited us for dinner at their campsite in Capitol Reef NP on Monday, more stopped by on Sunday during a break from their British motor car club activities. High season has begun in Torrey. Upcoming: It’s also sleep-deprivation season. The animals wake with the sun. The cat wants out now at 4:30 am. Any minute now the weather will shift so that we want to do our physical work early in the day and creative or computer work in the heat of the day. I need to pay attention to the clock, not the sun or I won’t get dinner ready until 9:00. I love the longer days, but it’s all about pacing right now. We have 120 days of frost-free weather to maximize in the days ahead. Next week is more planting, our irrigation cycle, and maybe a picnic after Carson’s stitches come out on Friday.